Abu Shehadeh, S. (2010). Misrade ha-mimshal ha-ẓvaʼi: Soẓi’alizaẓiyah la-medinah u-le-mangenone hakhfafah [The Military Rule Office: Socialization to State and Subordination Apparatuses], Sedek 5, pp. 10–19. Allen, S. (2001). Mat Urbanism: The Thick 2-D. In Hashim Sarkis (Ed.) Case: Le Corbusier’s Venice Hospital, pp. 118-126. Cambridge/New York: Harvard/Prestel. Anguelovski, I. (2013). Beyond a Livable and Green Neighborhood: Asserting Control, Sovereignty, and Transgression in the Casc Antic of Barcelona, International Journal of Urban and Regional Research 37(3) pp. 1012–34. Anguelovski, I., Connolly, J. T., Masip, L. & Pearsall, H. (2018). Assessing Green Gentrification in Historically Disenfranchised Neighborhoods: a Longitudinal and Spatial Analysis of Barcelona, Urban Geography 39(3) pp. 458-491. Athamny, A. (2009). Ledovev et ha-kirot: Zehutan shel ha-nashim ha-falestiniyot yoshvot ha-batim ha-falestinim ba-merḥav ha-yafo’i [Muttering the Walls: The Identity of the Palestinian Women Inhabiting the Palestinian Houses in the Jaffan Space] Masters Thesis, Ben Gurion University. Bimkom (2009). Meẓukat ha-diyur be-kerev ha-’ukhlusiyah ha-falestinit be-Yafo: Sof ʻidan ha-dayarut ha-mugenet be-nikhse reshut ha-pituʼakḥ [Housing Distress within the Palestinian Community in Jaffa: The end of Protected Tenancy in Jaffa], Jerusalem: Bimkom. Braudo, A. (2008a) (personal communication, March 3, 2008), Ramat-Gan: Braudo-Maoz Office. Braudo, A. (2008b) (personal communication, March 30, 2008), Ramat-Gan: Braudo-Maoz Office. Braudo, A. & R. Maoz (2010). Reconnecting the Tel Aviv and Jaffa Shoreline, Topos: The International Review of Landscape Architecture and Urban Design, 72, pp. 74-79. Brown, W. (2003). Neo-liberalism and the End of Liberal Democracy, Theory & Event 7(1), Project MUSE, doi:10.1353/tae.2003.0020. Bullard, R. D. (Ed.) (1994). Unequal Protection: Environmental Justice and Communities of Color. San Francisco: Sierra Club Books. Castree, N. (2000). Marxism and the Production of Nature, Capital and Class 76, pp. 5-32. Castree, N. & Braun, B. (1998). The Construction of Nature and the Nature of Construction: Analytical and Political Tools for Building Survivable Futures, in: B. Braun & N. Castree (Eds.) Remaking Reality: Nature at the Millennium, pp. 2-41.London: Routledge. Checker, M. (2011). Wiped Out by the ‘Greenwave’: Environmental Gentrification and the Paradoxical Politics of Urban Sustainability, City and Society 23(2), pp. 210-229. Corner, J. (1999). The Agency of Mapping, in: D. Cosgrove (Ed.) Mappings, pp. 213-252. London: Reaktion Books. Corner, J. (2006) Terra Fluxus, in: Charles Weldheim (ed.) The Landscape Urbanism Reader, pp. 21-33. New York: Princeton Architectural Press. Curran, W. & Hamilton T. (2012). Just Green Enough: Contesting Environmental Gentrification in Greenpoint, Brooklyn, Local Environment 17(9), pp. 1027-1042. Dooling, S. (2011). Ecological Gentrification: A Research Agenda Exploring Justice in the City, International Journal of Urban and Regional Research 33(3), pp. 621-639. Ellin, N. (2013). Urbanism – New, Landscape, or Otherwise: The Case for Complementarity. In A. Duany & E. Talen (Eds.) Landscape Urbanism and its Discontents: Dissimulating the Sustainable City, pp. 281-292. Gabriola Island, BC: New Society Publishers. Gibbs, D. & Krueger, R. (2007). Containing the Contradictions of Rapid Development? New Economic Spaces and Sustainable Urban Development, in: R. Kruger & D. Gibbs (Eds.) The Sustainable Development Paradox: Urban Political Economy in the United States and Europe, pp. 95–122. London, UK: Guilford Press. Gobster, P. H., Nassauer, J. I., Terry, C., Daniel, T. C., & Fry, G. (2007). The Shared Landscape: What does Aesthetics have to do with Ecology? Landscape Ecology 22, pp. 959–972. Golan, A. (2001). Shinuy merḥavi—Toẓa̕at miklhamah: Ha-shetakḥim ha-ʻaraviyim le-she‘avar be-medinat Yisra̕el, 1948–1950 [Wartime Spatial Changes: Former Arab Territories within the State of Israel, 1948–1950], Beer Sheva: Ben-Gurion University of the Negev Press. Hagerman, C. (2007). Shaping Neighborhoods and Nature: Urban Political Ecologies of Urban Waterfront Transformations in Portland, Oregon, Cities 24(4), pp. 285–297. Hartman, C., Keating, W. & LeGates, R. (1982). Displacement, How to Fight it. Berkeley, Calif: National Housing Law Project. Harvey, D. (2008). The Right to the City, New Left Review 53, pp. 23-40. Harvey. D. (1996) Justice, Nature and the Geography of Difference. Oxford: Blackwell. Idelitz, O. (1989) Shikum ve-hitkhadshut ʻAjamai ve-Lev Yaffo – kavim le-tikhnun [Regeneration of Ajami and Jaffa’s Center – Guidelines for Planning], Tel Aviv: Tel Aviv-Jaffa Municipality and Israel Housing Ministry [report]. Ilnayi, I. (2010, February 26). Ze’irim hasrei mano’akh [Restless Youths]. Yedi’ot Tel Aviv, pp. 26-28. Kear, M. (2007). Spaces of Transition Spaces of Tomorrow: Making a Sustainable Future in Southeast False Creek, Vancouver, Cities 24(4), pp. 324-334. Kushrak, N. (2008, December 9). Toshvei ʻAjami be-Yafo yekablu et ha-yam be-khazara [Ajami’s residents will get the sea back], Haaretz, https://news.walla.co.il/item/1394398, checked November 20, 2018. LAF (2016). The New Landscape Declaration. Philadelphia: Landscape Architecture Foundation. Levine-Einstein, K. & Glick, D. M. (2016). Mayors, Partisanship, and Redistribution: Evidence Directly from U.S. Mayors, Urban Affairs Review, doi: 10.1177/1078087416674829, pp. 1-33. Marcuse, P. (2012). Who’s Right(s) to What City? In N. Brenner, P. Marcuse, & M. Mayer (Eds.) Cities for People Not for Profit: Critical Urban Theory and the Right to the City, pp. 24-41. London and New York: Routledge. Marcuse, P. (1986). Abandonment, Gentrification and Displacement: the Linkages in New York City, In N. Smith and P. Williams (Eds.) Gentrification of the City, pp. 153–177. London: Unwin Hyman. Marcuse, P. (1985). Gentrification, Abandonment and Displacement: Connections, Causes and Policy Responses in New York City, Journal of Urban and Contemporary Law 28, pp. 195–240. Margalit, T. & Alfasi, N. (2016). The Undercurrents of Entrepreneurial Development: Impressions from a Globalizing City, Environment and Planning A, 48(10), pp. 1967–1987. Mazawi, A. E. & Khuri-Makhoul, M. (1990). 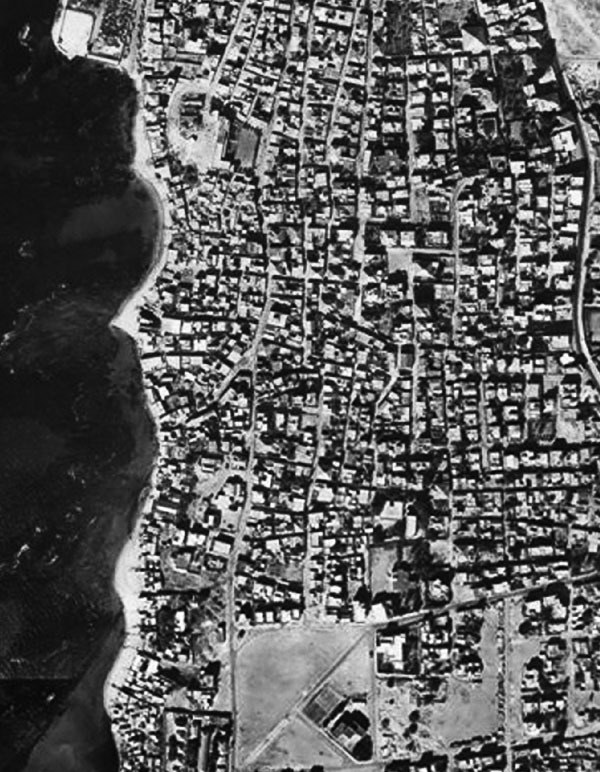 Mediniyut merkḥavit be-Yafo: 1948–1990 [Spatial Policy in Jaffa: 1948-1990], in: H. Luski (Ed.) City and Utopia, Tel-Aviv: Israel Publishing Co.
Mazor, A. (1981). memorandum to The City’s Engineer 25.1.1981. Tel Aviv-Jaffa City Engineer Department Archive, brown file of urban master plan 2236-1. Meishar, N. (in progress). Sea-Swept, Land Filled: An Urban Political Ecology of Beach Transformation: Jaffa 1948-1988, in progress. Monterescu, D. (2015). Jaffa Shared and Shattered: Contrived Coexistence in Israel/Palestine. Bloomington: Indiana University Press. Morris, B. (1994). 1948 and after: Israel and the Palestinians, New York: Oxford University Press. Nahum-Halevi, R. (2010, February). Likhyot be-sert [To live in the Movies], The Marker Magazine, pp. 124-123. Nitzan-Shiftan, A. (2003). Seizing locality in Jerusalem. In N. AlSayyad (Ed.) The End of Tradition, pp. 223-242. New York and London: Routledge. Quastel, N. (2009). Political Ecologies of Gentrification, Urban Geography 30(7), pp. 694-725. Rackham, S. (1996). Beyond Landscape MacArchitecture: New Languages, New Landscapes, Landscape Review 2(3), pp. 33-44. Rosen, E. (2006, November 9) be-Yafo tohim: ha-im le-akhar pinuy ha-zevel yavo’u ha-ʻashirim? [Some Wonder in Jaffa: Will the Rich Arrive after the Waste will Leave? ], Haaretz, Retrieved from https://www.haaretz.co.il/misc/1.1152800, accessed 12 November, 2018. Rosenzweig, R. & Blackmar, E. (1992). The Park and People: a History of Central Park, New York: Cornell University Press. Sandberg, L. A. (2014). Environmental Gentrification in a Post-industrial Landscape: the Case of the Limhamn Quarry, Malmö, Sweden, Local Environment: The International Journal of Justice and Sustainability 19(10) PP. 1068-1085. Shaqr, N. N. (1996). Ha-kehila ha-ʻAravit be-Yafo ʻal parashat drakhim kiyumit [The Arab Community in Jaffa on an Existential Crossroads]. Jaffa: privately printed. Slater, T. (2012) Missing Marcuse: On Gentrification and Displacement, In N. Brenner, P. Marcuse & M. Mayer (Eds. ), Cities for People not for Profit, pp. 171-196, New York: Routledge. Smith, N. (1998). Nature at the Millennium: Production and Re-enchantment, in: B. Braun & N. Castree (Eds.) Remaking Reality: Nature at the Millennium, pp. 269-282. London: Routledge. Swyngedouw, E. & Kaika, M. (2000). The Environment of the City…or the Urbanization of Nature, In G. Bridge & S. Watson (Eds. ), A Companion to the City, pp. 567-580. Oxford: Blackwell. Tel Aviv-Jaffa Local Planning Committee (1991). Minutes of Committee Meeting (13 February, 1991) [Brown File ‘Urban master plan 2236–8’] Tel Aviv-Jaffa City Engineer Archive. Tel Aviv-Jaffa Municipality & Braudo-Maoz Landscape Architecture (2006). Midron Yafo – sikum pgishot shituf zibur ve-hazagat tikhnun raʻayoni [Jaffa Slope – Summary of Public Participation Meetings and Planning Presentation]. Taylor, H. A. (1995). Urban Public Park: 1840-1900: Design and Meaning, Garden History 21(2), pp. 201-221. Thompson, I. H. (2012). Ten Tenets and Six Questions for Landscape Urbanism, Landscape Research, 37(1), pp. 7-26. Thompson, I. H. (2000). Aesthetic, Social and Ecological Values in Landscape Architecture: a Discourse Analysis, Ethics, Place and Environment 3(3), pp. 269–287. Waldheim, C. (2006). Landscape as Urbanism, In C. Waldheim (Ed.) The Landscape Urbanism Reader, pp. 35-54. New-York: Princeton Architectural Press. Wang, Z., Yang, B., Li, S. & Binder, C. (2016). Economic Benefits: Metrics and Methods for Landscape Performance Assessment, Sustainability 8(5) pp. 1-12, doi:10.3390/su8050424. Wolch, J. R., Byrne J. & Newell, J. P. (2014). Urban Green Space, Public Health, and Environmental Justice: The Challenge of Making Cities ‘Just Green Enough,’ Landscape and Urban Planning, 125 pp. 234-244. Yang, B., Li, S. & Binder, C. (2015). A Research Rrontier in Landscape Architecture: Landscape Performance and Assessment of Social Benefits, Landscape Research 41(3) pp. 314-329. MEISHAR, Naama. The Social Aftermaths of Landscape Architecture. SPOOL, [S.l. ], v. 5, n. 2, dec. 2018. ISSN 2215-0900. Available at: <https://journals.open.tudelft.nl/index.php/spool/article/view/3303>. Date accessed: 19 apr. 2019. doi: https://doi.org/10.7480/spool.2018.2.3303.